Little Farm in the Foothills: Father's Day Freebie! In this luminous prequel to the short story "The Christmas Visitor," you'll meet the O'Donoghue family: Maeve, Declan, Nuala and Ava...and Frank, Maeve's husband. Frank is celebrating his retirement when his son Declan tells Frank his startling news. The next day, St. John's Eve, June 23rd, Frank heads for his favorite getaway, a secret well, to ponder how to help his son, and perhaps make a fresh start for his own marriage to Maeve. This serene, verdant little glen has always had a calming, even a bit of a magical effect on him. There, Frank has an extraordinary experience that leads him to re-examine his own life as a husband and father. 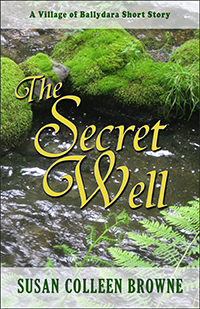 This gentle, uplifting story, just right for a summer day, explores Frank O'Donoghue's unforgettable journey toward wisdom...And with a fairy thread in the storyline, The Secret Well makes a companion read for International Fairy Day, June 24. The Village of Ballydara series also includes the novels, It Only Takes Once, Mother Love, and The Hopeful Romantic. The Secret Well freebie begins Tuesday, June 14, and runs until June 18...and for all you dads out there, Happy Father's Day! International Fairy Day and a Free Fairy eBook!